Tweetwall & Eventbrite Have Partnered! Today, we're very excited to announce something that we've been working on and have been looking forward to announcing for quite some time—Everwall and Eventbrite have partnered! Both Tweetwall, and Eventbrite are determined to make your events the best they can possibly be—for us, it's about making them more social and engaging, and for Eventbrite, it's by making it easy for your attendees to register and attend your event. 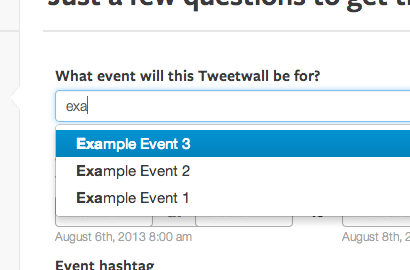 Getting started to create a Tweetwall is really easy, all you have to do is connect your Everwall account to your Eventbrite account and then when you create a Tweetwall, we'll automatically pull in all of your event's details. If you already have a Everwall account, you can easily add Eventbrite to your account. To do so, just login via Eventbrite. If you'd like to find out more, we've created a special partnership page for Eventbrite, which can be found here. Update: Eventbrite has written a blog post announcing the partnership as well.